A superb return that is well worth investigating. Close Res-O-Glas replica with improved neck joint and adjustable truss rod. Evocative, versatile sounds. With a dizzying number of brands - National, Dobro, Supro, Airline, Custom Kraft, Oahu and quite a few more - Chicago-based Valco Manufacturing made a dizzying array of products, from resonators and lap steels through to electric ‘Spanish’ guitars and amplifiers. - that interests us here. This is when Valco entered the solidbody electric guitar market and where, over the next decade and a half, it would create some of the most out-there and often innovative designs ever plugged into an amplifier. Gone but certainly not forgotten, Valco’s creations have been championed by numerous players, from the likes of David Lindley, Ry Cooder and Arlen Roth, through to modern artists such as Jack White and Dan Auerbach, not to mention a raft of blues players including Howlin’ Wolf, Jimmy Reed, JB Hutto and more. Jimi Hendrix’s first guitar was a Supro; David Bowie was another user; so, too, was Bob Dylan. Yet despite a huge number of instruments dropping into the US market during that time period, there have been very few contemporary reproductions outside of small number ‘boutique’ makers. Eastwood is one exception to the rule, while designers have used Valco as inspiration for their designs, notably Trev Wilkinson and his Italia creations. 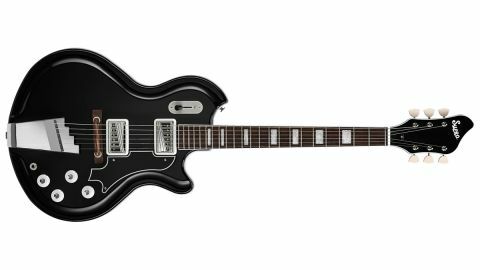 In terms of the electric guitar, however, there really hasn’t been a properly funded mainstream attempt to recreate Valco’s past - until now, with the reintroduction of these Supro guitars by ‘custodians’ of the brand, Absara Audio. To kick off 2017, then, Supro guitars are back, relaunched in two ranges: the modernised solidbody Island series of three guitars, and the more expansive 10-strong semi-hollow Americana series, modelled directly after probably the most famous, if originally short-lived, of Valco’s designs - the Res-O-Glas models. Today, we’re running the rule over the Dual Tone. On its launch in 1954, this guitar was called the Duo-Tone and described as a “super-powered electric Spanish guitar”. By the following year, it was known as the Dual-Tone and it had put on some body width and acquired the bass-pointed head that we see on today’s Island series. Aside from a couple of minor changes, it stayed pretty much the same until the Res-O-Glas version was launched in 1962, originally with plain pickup covers before changing to the silk-screened covers that we see on our 2017 reincarnation. The guitar was discontinued in 1966. The Americana’s construction (Dual- Tone and Coronado II) is totally different to the Island series. The semi-hollow body, with a thick overall depth of 48mm, is split in two halves and separated by a white or black (depending on body colour) rubbery plastic gasket. This is stapled internally to the bottom mahogany half, which is 24mm thick at the rim with a 90mm wide centre section, and reduced in between those points to approximately 12mm. to seal the structure. If you want to access the electrics, good luck: you have to take the neck off, then separate the two body halves. Both the Island and Americanas use ‘50s’ (also known as vintage) wiring, along with, says David, “a lot of one-meg ohm pots used because there are multiple controls and master volumes, and if you use 250k you start getting a lot of mush”. “By using this ‘50s’ wiring,” David continues, “you’re running the tone knob essentially off the wiper of the volume knob and as you turn the volume down that gives you a natural high-passing effect that counteracts the low-pass effect of the loading of the tone control. On its launch in 1954, this guitar was called the Duo-Tone and described as a “super-powered electric Spanish guitar”. Under the black finish, the neck appears to be maple, not mahogany as per its spec, and it’s attached via two cross-head bolts. Instead of the original’s curved joint, here the slightly fluted end of the neck sits very tightly - and quite high off the body - into a shallow rectangular slot in the top’s centre block. On our samples, it’s a very tight, secure fit. Scale length is shorter, too, plus we have a bigger headstock and a zero fret. Vista Tones have polepieces: the outer two simply rotate (they don’t move up or down), but allow the height of the pickup to be raised or lowered as well as holding it in its tall (17mm) moulded plastic mounting ring, which is recessed into the top of the guitar. The combination of that neck height and these pickup mounts means that the strings sit some 30mm at the apex of the jazz-style wooden-foot, two-piece bridge. The thick foot is screwed to the top, not that firmly, on the treble side, so under string tension you can move it to hopefully set your intonation correctly. A typical example of a guitar you’re best to restring one string at a time. Aside from being bigger-bodied as described, the Americana guitars (Dual- Tone and Coronado II) have slightly thinner-depth necks, but are still nicely shaped with a flatter C profile. These necks are bound in a bright white plastic and the fret gauge is pretty similar in width, although these are just a touch lower. Intonation is a little funky, although you can move the treble side to get more precise intonation. The post spacing suggests you could retrofit a tune-o-matic and then really secure the base. Now, the Americana series guitars share very little with their siblings, yet their sound is almost more conventional with a shade more attack and single coil-like percussion than the Island series. The construction seems to add a little more girth and depth that sits on the fuller, less attacking side, compared with our Strat, and sounds like a ‘lower wind’ version of a dual P-90-equipped PRS SE Semi-Hollow, which is a little fuller in the lower mids. Again, though, there’s plenty of jangle here in cleaner settings, very rockabilly and early rock ’n’ roll. There’s a little more power to the high strings, too, especially with a couple of tweaks, which makes for some great old blues leads, not least with a Supro Drive kicked in. There’s a bit more power, especially on the bridge pickup, although, again, careful setting of the heights between the two guitars is essential to really compare. The Coronado sounds a shade more ‘hollowbody’ and feels more familiar in both size and with that control layout, if you’re an ES-335-style player. There’s a really nice taper to the volume and tone knobs on the Island series’ controls that seem less predictable on the Americana’s. To be honest, we’ve kept things pretty much full up and let our pedalboard take the strain. At volume, too, the Americanas ease into feedback, although not microphonic squeal. Americanas do a great job of replicating the originals, adding a better neck joint and an adjustable truss rod, although the wooden bridges and the lack of easy access to the electrics might bother some. There are limited colours available on the Americanas and no lefties in either range. There are no included gigbags, either, which doesn’t help the impression that these guitars are on the high side, price-wise. But Valco’s original guitars were never a head purchase, were they? They were about the heart, and these have both character and vibe in spades, not least in the sound department - a voice that, if not forgotten, is certainly overlooked, and extremely valid for the player looking back to the 60s to create different and new sounds. And with a raft of designs from the past to draw on, we suspect Supro is back for the long haul. We certainly hope so - we haven’t had as much fun as this for ages!